Crushed stone flew out of the floor as though driven by some underground force, and seven mouse heads with seven sparkling crowns rose up, squeaking and squealing hideously. This enormous mouse was hailed by the entire army, cheering with three loud squeaks. And then the army set itself in motion -- hop, hop, trot, trot -- heading straight for the toy cabinet. At the same time, Marie saw a strange glow inside the toy cabinet. All at once, Nutcracker jumped from the cabinet, and the squeaking and squealing started again. "Trusty Vassal-Drummer," cried the Nutcracker, "sound the advance!" The drummer played so loudly that the windows of the toy cabinet rattled. A clattering was heard from inside, and all the boxes containing Fritz's army bursted open. Soldiers climbed out and jumped to the bottom shelf. Then they formed ranks on the floor. The Nutcracker ran back and forth, shouting words of encouragement to the troops. A few moments later, guns were going boom! boom! The mice advanced and overran some of the artillery positions. Such was the confusion, and such were the smoke and dust, that Marie could hardly see what was going on. But this much was certain -- both sides fought with grim determination, and for a long while victory hung in the balance. Then the mice brought up more troops. The Nutcracker found himself trapped against the toy cabinet. "Bring up the reserves!" he cried. And true enough, a few men came out, but they wielded their swords so clumsily that they knocked off General Nutcracker's cap. The Nutcracker was in dire peril. He tried to jump over the ledge of the toy cabinet, but his legs were too short. In wild despair he shouted, "A horse, a horse! My kingdom for a horse!" At that moment, the King of Mice charged the Nutcracker. Without quite knowing what she was doing, Marie took off her left shoe and flung it with all her might, hoping to hit the Mice King. At that moment, everything vanished from Marie's sight. She felt a sharp pain in her left arm and fell to the floor in a faint. When Marie awoke from her deep sleep, she was lying in her own little bed. The sun shining into the room sparkled on the ice-coated windowpanes. A strange gentleman was sitting beside her, but she soon recognized him as Dr. Wendelstern. "She's awake," he said softly to Marie's mother. She came over and gave Marie an anxious look. "Oh, Mother dear," Marie whispered. "Have all the nasty mice gone away? Was the Nutcracker saved?" "Don't talk such nonsense, child," said her mother. 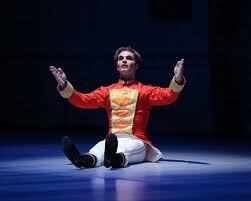 "What have mice got to do with the Nutcracker? Oh, we've been so worried about you. Last night, I went into the living room and found you lying beside the glass toy cabinet in a faint, bleeding terribly. The Nutcracker was lying on your arm, and your left shoe was lying on the floor nearby..."
"Oh, Mother," Marie broke in. "There had just been a big battle between the dolls and the mice. The mice were going to capture the poor Nutcracker. So I threw my shoe at the mice, and after that I don't know what happened." Marie's father came in and had a long talk with Dr. Wendelstern. Marie had to stay in bed and take medicine for a week. Then Godfather Drosselmeier came to visit. "I've brought you something that will give you pleasure," he told Marie. With that, he reached into his pocket and took out the Nutcracker, whose lost teeth he had put back in very neatly and firmly, and whose broken jaw he had fixed as good as new. Marie cried out for joy! That night, Marie was awakened in the moonlight by a strange rumbling. "Oh, dear, the mice are here again!" Marie cried out in fright. Then she saw the King of Mice squeeze through the hole in the wall. He scurried across the floor and jumped onto the table beside Marie's bed. "Give me your candy," he said, "or I'll bite your Nutcracker to pieces." Then he slipped back into the hole. Marie was so frightened that she could hardly say a word. That night she put her whole supply of delicacies at the foot of the toy cabinet. The next morning the candy was gone. Marie was happy because she had saved the Nutcracker, but that night the Mouse King returned. "Give me your beautiful dress and all your picture books," he hissed. Marie was beside herself with anguish. The next morning she went to the toy cabinet sobbing and said to the Nutcracker, "Oh, dear, what can I do? If I give that horrid Mouse King all my books and my dress, he'll just keep asking for more." The Nutcracker said in a strained whisper, "Just get me a sword..." At that his words ebbed away, and his eyes became fixed. Marie asked Fritz for a sword, and Fritz slung it around the Nutcracker's waist. To see how "The Nutcracker" ends, go to the next page.